Killer whales' immune systems as well as their ability to reproduce are at risk due to contamination of polychlorinated biphenyl (PCB) - a chemical that was commonly found in electronics - despite having a near-global ban over 30 years ago, say international researchers. The team suggests that the PCB threat affects more than half of the world's orcas and over the next hundred years, the whale populations near industrialised regions, and those at the top of the food-chain are at a high risk of population collapse. This valuable study extends previous work within the author team which found alarming levels of, particularly, polychlorinated biphenyls (PCBs) in North Atlantic killer whales, and further, found these levels to have an immunotoxicological impact in an in-vitro setting. Using an individual-based model framework and available data on PCB concentrations in global populations of killer whales, the author team showed that PCB-mediated effects on reproduction and immune function threaten the long-term viability of >50% of the world’s killer whale populations. Indeed, in a number of populations today there is strong evidence of reduced fertility and even complete cessation of reproduction. The extension of previous findings via such modelling efforts serve to underscore the significance of the global chemical pollution problem. 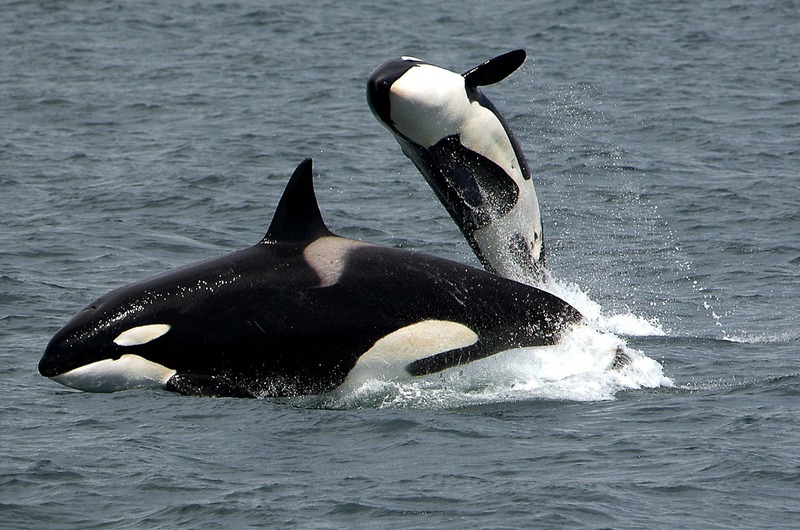 PCBs manufacture has been tightly regulated world-wide for more than a decade, yet the legacy of these chemicals remains a constant environmental threat for high trophic level consumers such as killer whales. Further, 10 million new chemical substances are produced every year for application in everything we consume and use. As such, the effects of known harmful chemicals, such as PCBs, must be considered in the context of the cocktail of chemicals, humans and wildlife alike are exposed to daily, for which toxicity is yet to be properly evaluated. Killer whales are apex predators and sitting at the very top of the food chain means they are more susceptible to pollutants in the ocean. Persistent organic pollutants (POPs) such as industrial chemicals like PCBs and pesticides like DDT build up in food chains, with their concentrations multiplying each step up from prey to predator. Although PCBs were banned in the late 1970s, their persistent properties cause them to stick around. What makes PCBs unique from other toxins is that its molecules are extremely fat-soluble, meaning they accumulate easily in fats. Unfortunately, once these PCBs are in the orca, the toxins don’t go away. As PCB concentration increases in an individual, it can impair reproduction, disrupt the endocrine and immune system, and ultimately reduce the animal’s lifespan. Dr Ian Musgrave is a Senior Lecturer in the Faculty of Medicine, School of Medicine Sciences, within the Discipline of Pharmacology at the University of Adelaide. Polychlorinated biphenyls (PCB’s) are industrial chemicals that were used in a variety of processes and systems (for example as coolants in transformers). Although PCB production ceased to the 1990’s, these chemicals are widely distributed in the environment and breakdown slowly, so although PCB levels have been declining since the ban, there is still a significant amount of them in the environment. PCB’s dissolve readily in fat and can accumulate in predators. This is particularly worrisome in animals such as killer whales which not only eat contaminated fish but other predators such as penguins and seals which have accumulated far more PCB’s than fish. As well, killer whales have substantial fat deposits that allow them to accumulate high levels of PCB’s. This study uses measured levels of PCB’s in blubber from killer whales in a variety of locations and mathematical modelling to predict the effect of these PCB levels on population growth of these animals. Based on the results of these simulations some populations are expected reasonable population growth (eg some Antarctic populations) while others are predicted to have populations decline (eg Faroe Islands and Iceland populations) while still others were likely to collapse completely (eg. populations near Japan). The modelling is reasonable and consistent with modelling in dolphins. I have to admit this paper made depressing reading. The team have used existing data on reproduction and survival rates of Killer whales and combined it with known levels of PCBs (or polychlorinated biphenyls) in their bodies as well as the known effects of these compounds (PCBs are known to negatively affect immune systems and reproduction rates for example). All this data has been used to create a model of the potential future growth of different killer whale populations around the world. The results are not encouraging. The model suggests many, though not all, Killer Whale populations are in serious trouble. Now, it is only a model and thus will have some rate of error associated with it, but considerable thought seems to have gone into its creation and some of the predictions have already started to ring true. For instance, the model predicts very serious problems for Killer Whales in the UK and a whale found dead, off the coast of Scotland last year contained some the highest PCB levels ever recorded.